The Goalpara District Congress Committee on Tuesday took a fresh breath as it successfully occupied 16-member Goalpara Zila Parishad with its seven elected members. In a meeting, held at the DC’s conference hall, presided over by deputy commissioner Varnali Deka, the new committee was formed under Section 70 of Panchayatiraj Act 1994 with secret ballot papers. Congress candidate Demjia Marak received eight votes out of fifteen votes (one member remained absent). Demjia defeated Porita Rankho by one vote, who was the common opposition candidate of Rabha Hasong Joint Movement Committee, AIUDF and BJP, and became the president of the Goalpara Zila Parishad. Significantly, Firoza Begum, AIUDF member from Jaleswar constituency remained absent in the election which melted the chance of the opposition to stand equal with the winning Congress candidate. 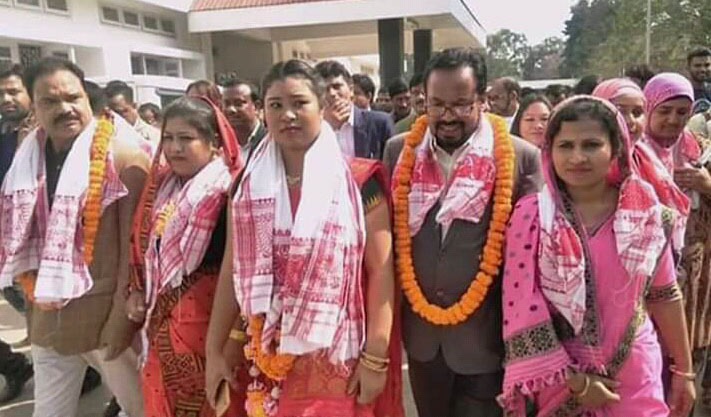 On the other hand, Sharifa Ahmed, an independent candidate, who defeated Congress MLA AK Rasid Alom’s sister at the Matia constituency in the election, became the vice president of the new zilla parishad committee. She defeated another rival Congress candidate Mehera Khatun from Chunari constituency. In the sixteen-member Goalpara zilla Parishad, Congress had won seven seats, both BJP and AIUDF three seats each. Earlier, deputy commissioner Varnali Deka administrated the oath to the new Zila Parishad members. Meanwhile, Abdur Rasid Mondal MLA of West Goalpara who took the major initiative in winning the Zila Parishad in favour of Congress, became ecstatic. “Despite tremendous pressure and temptation by the opposition to the newly elected members, we have occupied the Parishad,” said an elated Rasid Mondal. Another Congress MLA AK Rasid Alom also extended cooperation in the entire party mission to capture the Zila Parishad.